A class action lawsuit alleges that an engine defect can cause Hyundai Tucson and Kia Soul vehicles to stall and even burst into flames. Plaintiffs claim that Hyundai and Kia have concealed the defect from consumers for years. The Hyundai, Kia engine defect has allegedly affected thousands of car owners and others on the road when vehicle engines fail unexpectedly, stall, and even catch fire. Ring of Fire’s Farron Cousins discusses this issue with Scott Hardy from Top Class Actions. Farron Cousins: For most Americans, other than buying a house, the second biggest expense you will have in your life is buying a vehicle. So when you go to a dealership and you drop tens of thousands of dollars on a car, you want to make sure that this car does not have any defects, that it’s going to last you a long time and you’re not going to have to turn around and go to the shop a few months later. But unfortunately, as is so often the case, we see auto recalls happening in this country all the time and nearly every one of those recalls is because the company decided we can cut a corner here, we can cut a corner there, save us a couple of bucks and nobody will ever know. Well, we find out, and right now we’re finding out because we have vehicles in this country that are bursting into flames. Joining me now to talk about this is Scott Hardy from Top Class Actions. So Scott, right now there is a class action suit, a big one here for a Hyundai and Kia automobiles. 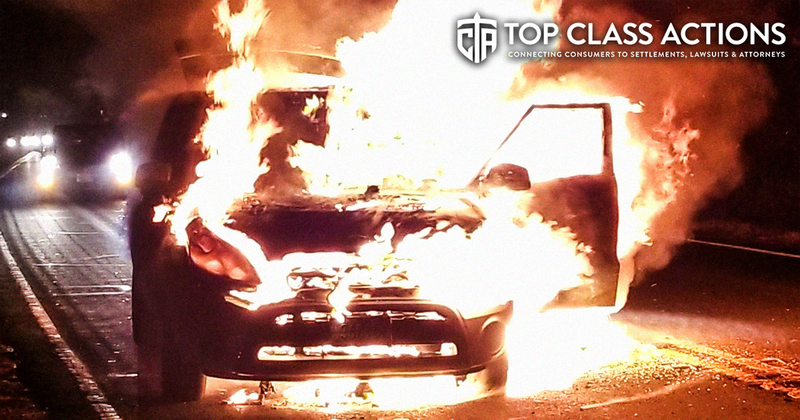 Certain brands of those, there is a defect that could potentially cause the car to burst into flames. That sounds like a really big deal, if you’re driving along and suddenly your car is on fire. Tell us what’s happening here. This is outrageous. Scott Hardy: Yeah, this is pretty crazy. And it seems like it came to light because you know, Hyundai and Kia owners were having problems with their engines and of course if you have a problem with your engine, this isn’t a simple fix. You’re not going into the dealer and pay a couple hundred dollars. You’re paying thousands of dollars. And the Kia, the Hyundai class, Hyundai Kia class action alleges that if you’ve got a 2011 to 2013 Hyundai Tucson or a 2012 to 2016 Kia Soul, that the defect, the defect affects those cars that have a gasoline direct injection. And during the manufacture of these direct injection engines, they suffer from improper ceiling, which could cause oil leaks. And of course if you have oil leaks and you’re leaking oil, that can cause all of the pistons and the rods to not have the proper lubrication and prematurely wear out and then cause much larger engine problems. And then of course you’re looking at anywhere from $3,000 to $6,000 to get this fixed. Now Kia, Hyundai Kia has actually come out and done a recall of their 1.6 liter gamma engine, which includes 120,000 Tucson’s and 378,000 Souls. But the the three, the, the recall doesn’t include the Kia Soul plus or the 2.0 liter new engine and that’s what this class action is targeting because they’re saying, hey, you already know this defect is in the 1.6 liter. It’s, looks like it’s actually the 2.0 liter as well. We to get this fixed, we need to be covered because we can’t afford to buy these cars and have to dump $3,000 to $6,000 into the engine in less than 100,000 miles. I mean that’s just crazy. Farron Cousins: What’s interesting to me here too is that the lawsuit says, you know, Kia and Hyundai, they knew about these problems for years according to the lawsuit, but only decided to finally issue that recall when they started getting all these complaints. They knew the complaints were coming. They could have fixed the problem then, they chose not to. They waited to see, is this going to affect enough people? Is this going to be a problem or is it going to be just a couple vehicles out there that have this premature engine failure? Well, numbers started adding up very quickly for them and they realized, okay, now we have to do something. But to me, the, the astounding part of this, and again, we see this so frequently with auto makers is that it can be a, a $2 part. And what I mean is the company will go with a cheaper alternative to a certain part and it may save them $2 per vehicle. It may save them $500 per vehicle. You know, we will find out more as this progresses here. But I’m willing to bet because we’re talking about something as simple as an improper seal. This is probably going to be one of those cases that gets more disgusting when we find out, oh, this was a, you know, $5 piece, a $10 piece, putting people’s lives at risk costing them thousands of dollars because you wanted to save literally a couple of dollars here. Scott Hardy: Exactly, and it’s, I think it’s not just the saving a couple of dollars, it’s as you said this is a $2 part. Maybe if they made it a $4 part of thicker gasket or something that might have fixed it, we’ll find out as you mentioned. But service and maintenance and repair is a huge profit center for auto makers and so they’re not heavily motivated to really get a problem like this fixed because their dealers are making money hand over fist when they’re actually getting these, these bad engines and the allegedly defective engines in to get fixed. They’re like, hey, I got $3,000 bucks, boop back in my pocket and Hyundai and Kia is sending out those parts to repair it. So boop, that money goes right back in their pockets and they’re like, hey, why should we fix it? That might be, that might be improper use on your part car owner. You might’ve just warn that engine and maybe you didn’t get your engine oil change like you should have. I’m sure this isn’t us, but then the consumer’s fight back. They go ahead and put thousands of complaints, put their voice, make their voice heard that they’re experiencing this problem, that it, that it is a defect and you get things like this that happened, which will hopefully result in money in the pockets of those impacted. And we want to make sure that if you had a Hyundai or Kia Soul or the Hyundai Tucson and this happened to you, save your receipts. If you lost your receipts, go to the dealer, go to the repair shop, get copies of those receipts. Because once this thing’s certifies, if it’s not already certified, we should probably see a settlement within about 6 to 12 months. And if you have those receipts, you will very likely be able to get that repair money back. Farron Cousins: Right. And again, as you pointed out, we’re talking about thousands of dollars here to repair, to repair engine failure. So this is not like, ah, I don’t need to go get my $10. No, no, no. You may have spent thousands of dollars on this and you could, you know, hopefully get your money back through this lawsuit that is happening right now. And if you need any more information on this to see the vehicles affected, follow the link in the description of this video. Head on over to the topclassactions.com and while you’re there, sign up for their newsletters. It is one of the most effective tools that consumers have to arm themselves with the information that they need in today’s world, Scott Hardy, topclassactions.com. Thank you very much for talking with us. Scott Hardy: Thanks for your time Farron.